154 min [ Just because you are a character doesn't mean you have character. ] 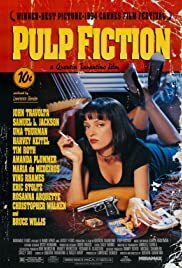 - A burger-loving hit man, his philosophical partner, a drug-addled gangster's moll and a washed-up boxer converge in this sprawling, comedic crime caper. Their adventures unfurl in three stories that ingeniously trip back and forth in time.